The Spruce Stove is an outdoor furnace that allows you to burn an entire tree at a time. 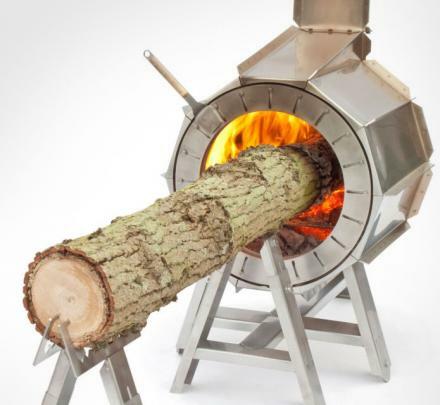 Designed by Dutch designers Roel de Boer and Michiel Martens, the dutch stove allows you to continuously push the trunk of the tree more and more into the fire as it burns, as it holds the log up level to the fire using wheeled arms that allow you to easily slide it in. To start the fire, simply use kindling, amber, small twigs, etc, and once the fire gets going simply push the end of the tree trunk into the fire, use the adjustable diaphragm to allow for more oxygen or less oxygen depending on what the fire needs. Once your fire starts to die down, simply push a few more inches of the trunk into the fire. When you want to stop the fire just stop pushing the log in. The Spruce Stove is made from stainless steel, can easily withstand the heat of the fire as well as the weather, comes in three different models, weighs 110lbs, and measures 1.9 feet wide x 7.7 feet tall x 2.6 feet deep. Now you just need go chop down a few trees.